Gigi has a bunch of vanilla socks on the needles. Gigi wasn't happy with her progress on her "On the Vine" scarf, so she has been sitting and doing a repeat every day after lunch, which is working well for her. Jasmin has started Ene's Scarf (which she isn't sure of the pronunciation of) from Scarf Style out of Artyarns Cashmere 1. (This was part of her half-off cashmere haul.) She has knit the first eight rows so far. This project has taught her that the rubber Bryson Stitch markers and the Addi lace needles do not mix. Jasmin has finished spinning 1 oz of Merry Meadows cormo and silk (in spring green). 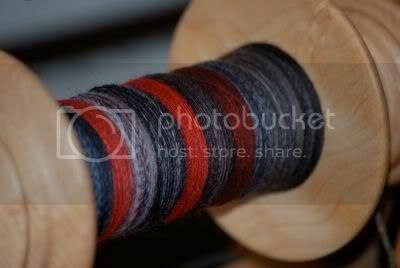 She has spun it very fine, so she's working on Black Magic Woman from Crown Mountain Farms. Gigi has started the Bulky Boot Socks from the Little Box of Socks. 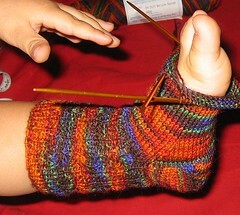 Gigi has also started the Scandanavian Sock pattern (also from the LBoS). They discuss the two-handed fair isle technique that Ann and Eugene Bourgeois (of Philosopher's Wool) teach. Jasmin has finished knitting the Santa Fe Wrap. Gigi unearthed an UFO made of Rowan Ribbon Twist (in black/pink), which is now becoming a sweater for Jasmin. 2- Stick to your budget. - Gigi will be buying some sock yarn. - Jasmin encourages you to take your list on a post-it. - Go through your stash so you don't replicate colors that you have a lot of in your stash. - Always buy more yarn, rather than less. - On Gigi's second walkthrough, she eliminates items that she's not in love with. - On Gigi's third walkthrough, she starts making purchases. If it was meant to be, it will still be there. - First time attendees: Go with someone who has gone before. - Eat a good breakfast. - Make sure to sit. And socialize! - Shop from vendors who are out of your normal area. 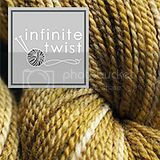 - Don't buy yarns that you have access to at your LYS. Hold off on those purchases until the month AFTER Stitches. - A bouquet of handpainted sock yarns. - A gift certificate for time to knit, uninterrupted. - Really good quality chocolate. - A lovely mug, and possibly a mug warmer. - A trip to an out-of-town fiber festival. Gigi installs an enclosed zipper BEAUTIFULLY. And backwards. The Crown Mountain Superwash Merino (in Black Magic Woman) is so lovely, even Hana (the Akita puppy) wanted some. Go give Tika's podcast, Gives Good Knit, a listen! Come meet us at Stitches West on Saturday, February 28th from 2-4PM in the Purlescence booth! The BMW colorway is beautiful spun up! Hi Ladies, Love your podcast! I have an idea for Gigi and her backwards zipper turn the bag inside out and use it for the inside of another bag ...like a knit bag or some other fabric bag...hope it helps! Keep up the great work ladies and remember to "knit more"!!! Darlene in PEI where we just had a huge big winter snow storm! More time to knit! I think I may use some of your strategies for my trip through the Madrona market next week. I realize this is nothing like Stitches, but considering I am unemployed and will be surrounded by a ton of goodies? I think a lot of this is a good thing to keep in mind/strategize for. Also? YAY! You added the time in for the various segments. Thank you!